Directors/Producers: Michael Rosenburg and Philip Chapman. Photographers: Jim Clare and Colin Clarke. Additional Contributors/Actors: Stan Watts and Frans Lanting. 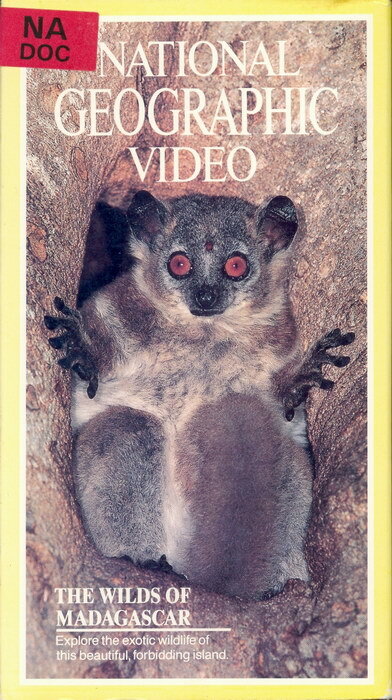 This National Geographic Society video presents the wildlife of Ankarana in northern Madagascar. Explore the exotic wildlife of this beautiful, forbidding island. Just off the East coast of Africa, Madagascar is an island unique in all the world. Separated from the mainland 165 million years ago, Madagascar's flora and fauna have evolved in near isolation. Join a team of naturalists as they trek to the island's remote Ankarana plateau to study the exotic animals of this forbidding wildlife oasis. By way of enormous underground passages, you'll hike to a sunken forest, sighting rare creatures such as the crowned lemur, the leaf-tailed gecko, and the souimanga sunbird in THE WILDS OF MADAGASCAR. The National Geographic Society was founded in 1888 to increase and diffuse geographic knowledge. It has been dedicated to the exploration of earth, sea, and sky for more than a century. The Society fulfills its mission through vivid eyewitness journalism, award-winning photography and cinematography, and support for scientific research around the world. This landmark home video collection is part of the National Geographic Society's continuing effort to use the latest technology in support of this educational mission. 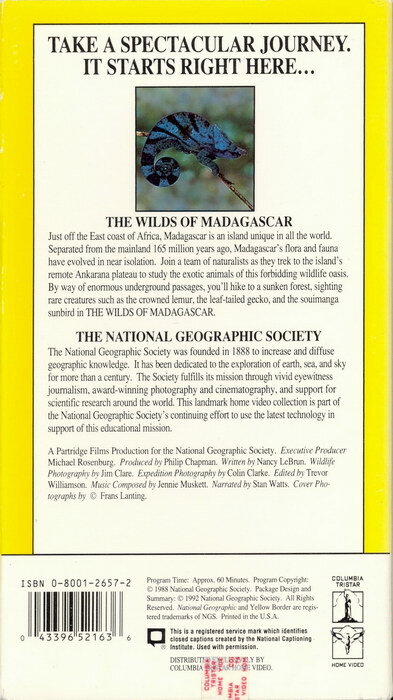 A Partridge Films Production for the National Geographic Society. Executive Producer Michael Rosenburg. Produced by Philip Chapman. Written by Nancy LeBrun. Wildlife Photography by Jim Clare. Expedition Photography by Colin Clarke. Edited by Trevor Williamson. Music Composed by Jennie Muskett. Narrated by Stan Watts. Cover Photographs by � Frans Lanting. Very Good. Front of box somewhat faded.